Dne 1. julija 2017 je bil za klub SHI-DO pomemben dan, tako imenovan dan črnih pasov. Dan je bil namenjen posebnemu obredu, obredu 108-ih bojev, ki ga je opravil učitelj šole SHI-DO Andrej Doušak, 6. Dan. Vsak izmed 108-ih bojev je trajal 1 minuto in 30 sekund, vsakih 10 bojev pa je bil s strani obrednika izveden tameshiwari. Po 50. in po 100. boju je bilo 5 minut premora. Obred 108-ih zaporednih bojev je potekal po načelih kontaktnega karateja brez točkovanja. Obrednik je tekom bojev na osnovi kat (form) iskal princip vode in lune ter umetnost ritma in razdalje. Končni cilj bojev in celotnega obreda je bil čimvečja učinkovitost s čim manj napadi kot preverjanje lastne zrelosti. Ni pomembno premagati nasprotnika, temveč potom harmonije onemogočiti lasten poraz in njegove napade. duhovni princip, najvišji in najgloblji princip. Prav sem spadajo tudi véliki obredi, kakor je recimo véliki obred 100-ih bojev v karateju. Ta izhaja iz šole Kyokushinkai, ki jo je osnoval véliki pokojni Učitelj Masutatsu Oyama. Ta obred predstavlja obred preobrazbe človeka, kateri potom 100-tih zaporednih bojev skuša globlje spoznati samega sebe. 1st July 2017 was a very important day for our club SHI-DO, so-called »black belts day«. 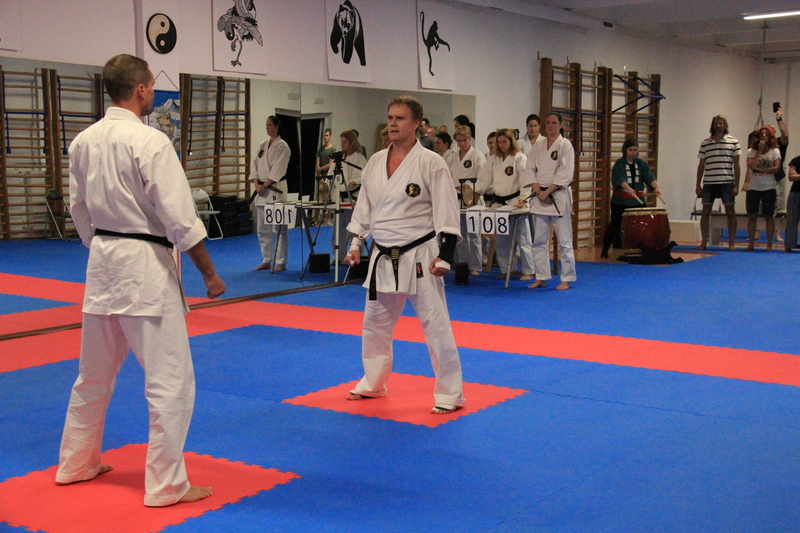 It was dedicated to a special ritual – the ritual of 108 man Kumite, which was done by the Teacher Andrej Doušak, 6th Dan. Each fight lasted 1 minute and 30 seconds and after every 10 fights Andrej performed a tameshiwari. A 5 minute break followed after 50th and 100th fight. The ritual of 108 consecutive fights proceeded in principles of contact karate without the grading system. During the fights Andrej was searching for principles of water, moon, the art of rhythm and distance based on kata. The aim of fights and the entire ritual was maximum efficiency with as little attacks as possible to check his own maturity. It’s not about defeating the opponent, but prevent one’s own defeat and the opponent’s attacks with harmony. The Great rituals belong here, such as the Great ritual of 108 man kumite in karate or the Great ritual of 100 man kumite. The ritual of 100 or 108 man kumite in karate originate in the Great ritual of Kyokushinkai school which was established by the Great deceased teacher Masutatsu Oyama. It represents the ritual of one’s transformation. Along the 100 consecutive kumite one is trying to know oneself on a deeper level. I personally chose the ritual of 108 man kumite (not 100) for 2 reasons. 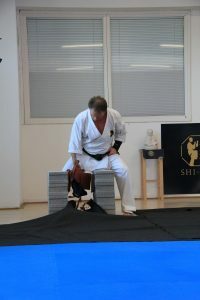 First reason is that I’m not a member of Kyokushinkai system so I didn’t dare to do the 100 man kumite the same way as them out of respect for this Great school because it would be immoral to my japanese colleagues. Second reason is the special number 108 which is very important in many eastern cultures relating to martial arts and the philosophy of life. For example: the highest kata in karate is called Suparimpei which means 108 steps on a path of a person. A long form in Tai-chi Chuan is called the Form 108. There are 108 acupressure points in martial arts. They say there are 108 mistakes, fears and diseases that a man confronts with in different lives in order to experience enlightenment. The ritual isn’t just bare test of the body, mind and one’s current capability. It is literally a gift – a gift of oneself, a gift of aim to something bigger, a person, something, anything. That is the ritual. Only with these principles are we able to improve ourselves and possibly get farther up.